You, as a reader, are participating in a literary event of genuine historic significance. By making his act available to the readers of the Journal, Paul will undoubtedly give the magic field another shaking up. To ask, "Who else does this?" would not be the right question. A better question would be, "Who else COULD do this?" How many people do you know with a close-up act of original routines, presentations, and patter that has successfully served them professionally for over a decade? This filter alone eliminates 98% of the magicians I know! 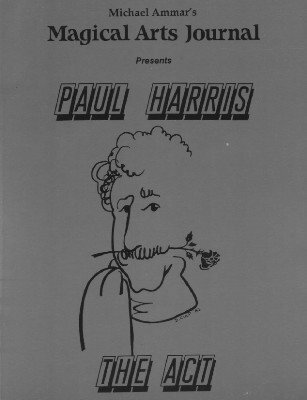 Paul Harris. His entire act. What more needs to be said? This publication has been out-of-print for years. The original retail price was $18.00. Finally, it's available here as an instant download.